It’s February and the trends for 2019 are popping up everywhere… I’ve seen and heard them all; colored stone trim set in bold yellow gold (how very 1985! ), mixed metals – platinum and 18 karat yellow gold is my fave, and the biggest craze from this year is the comeback of the marquise diamond. This elongated, elegant beauty will once again reign supreme! The bridal set shown here is a real showstopper – I’ve fallen a little in love with it. 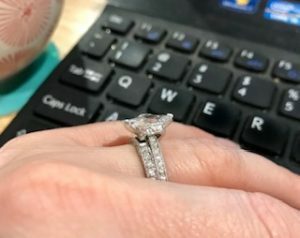 Even now, as my fingers strike the keys, it’s standing tall and proud on my ring finger (I need to wear it for inspiration, right?)! I have to say, this pair of rings is spectacular from every angle. The engagement ring features a double loop design that lifts the center diamond to dazzling heights. And what a diamond it is… this perfectly shaped marquise tips the scale at 1.26 carats. This nearly colorless gem is accented by an additional forty-six round brilliant diamonds that have a combined weight of .58 carats. That’s 1.84 carats of bling! And yet, I am crazy about it! Typically, I vote against fitted bands. I don’t mind small gaps between rings, actually, I like the separation. However, the wedding band in this duo is notched to fit snugly with the engagement ring and it’s ideal, keeping them locked together. While a Tolkowsky-Cut stone will always be my first choice, this shapely diamond is exquisitely beautiful. In fact, it’s just as nice as a right-hand ring… wink wink! 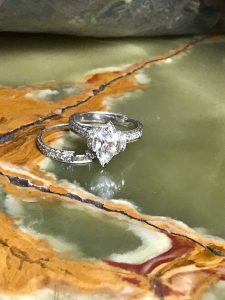 When a center stone sits high on a ring, I usually worry about it getting a lot of wear and tear. However, this set is made entirely of platinum. 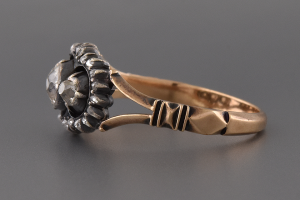 The diamond is well protected in this unique double loop setting with a pair of V-shaped prongs on each tip. It’s strong and secure. I like things that go together, but are not usually what I call “matchy-matchy”. In this particular case, I must admit that I prefer the matched style… and those heavily engraved edges! LOVE! It adds a vintage flair to an otherwise modern style. Here’s my point… when looking for a new piece of jewelry, be open-minded! Look at all of the options. You never know when something will catch you by surprise like this ring did for me! Right this moment, as I’m writing, the countdown to Christmas is looming in the back of my mind. I can almost hear it ticking by… 41 days, 40 days, 39, 38, 37, 36. There’s a bite in the air, and scattered snowflakes have been on the windshield of my car more than once. As the holiday approaches, more and more shoppers are stopping into Joden. Some are looking for inspiration, hoping for the perfect gift. Some have an idea but haven’t nailed down the details. And others know exactly what they want – an engagement ring. On the Top Ten List of days to get engaged, Christmas Eve is number one, and Christmas Day is number two. 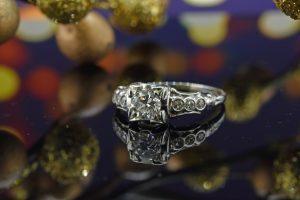 During this celebratory time, while loved ones are gathered together, ’tis the season for proposals. Sure to elicit screams of “Yes!”, this charming engagement ring is just one of many available exclusively at Joden. Made from 18 karat white gold during the 1950’s, this ring features a bright white Modern Transitional European Cut diamond as the center stone. The diamond weighs approximately .40 carat. This fine diamond is flanked by six sparkling single cut diamonds, each one set in a tiny bezel. These stones have a combined weight of .10 carats bringing the total diamond weight of this Mid Century Modern beauty to .50 carat. It’s modestly priced at $2450 and can be found in Joe’s Special Box. Silver was discovered in Virginia City, Nevada in 1860. 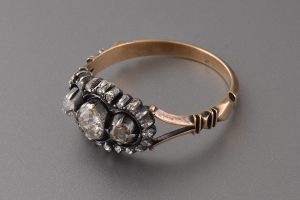 It was very popular during the mid-1800’s and was often combined with low karat gold. Here, the darkened silver overlays a 14 karat gold base. Two of the most utilized diamond cuts were Old Mine Cuts and Rose Cuts – this beauty has both. Three Old Mine Cut diamonds (.50 carat total) create the center. They are surrounded by a scalloped halo of twenty-four rose cut diamonds (.25 carat total). These bright white sparklers twinkle with every turn of your hand. 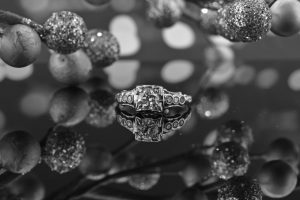 The Old Mine Cut diamonds are held in place with “claw” prongs – a new style for the period. 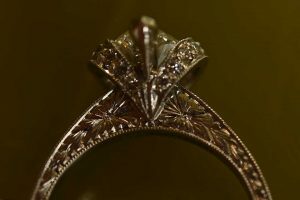 My favorite detail of this ring has taken nearly 150 years to develop. Just look at the gorgeous patina on the band of the ring! The oxidation of this piece brings it to life, showcasing each design element – from the split shoulder to thehand-carved lines. It’s absolute Victorian perfection. 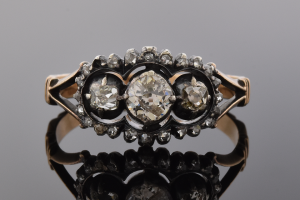 Priced at just $2000, this ring is a steal – a true antique in pristine condition. Take our heirloom and make it yours.